Manchester United have a history of grooming young promising players into superstars and the best example anyone can give is that of Cristiano Ronaldo. United also have a history of spending heavily on teenage sensations and they’ve broken the record for highest transfer fee paid for a teenager on three separate occasions – when they signed Wayne Rooney, Luke Shaw and Anthony Martial.United is one club which is known for promoting young players instead of heavily relying on imported first team players. Interestingly many of the teenagers who played for Man Utd were also able to score on their club debuts and then there are also others like Danny Welbeck who scored on his Premier League debut for the club or Mame Biram Diouf who scored on his home debut for the club. But none of that matches the feeling of scoring on the club debut as a starter or even as a substitute. So here are eight players who scored on their club debut for Manchester United when they were teenagers. After all, is there a better impression than the first one? Note: This is not an exhaustive list. On transfer deadline day in the summer of 2015, Manchester United shocked the football world by making a sensation swoop for Monaco’s 19-year-old striker Anthony Martial. It was not the move, but the fees that United paid for the player that made the headlines as the footballing giants spent £36m which could rise up to £58m in the future. With all the buzz surrounding one of the biggest moves in the history of the game, Martial had a point to prove on his debut. If he could leave a first impression like no other then he would have done enough to close the mouth of many who questioned his abilities. The Frenchman’s debut for United came against arch-rivals Liverpool on 12 September 2015 in a Premier League game. He came on as a substitute for Juan Mata in the 65th minute with the score 2-0 in favour of Man Utd. In the 84th minute of the game, Christian Benteke scored an unbelievable goal to give Liverpool a chance to get something from the game. But, Anthony Martial had other things in mind. Seconds after the goal from Benteke, Martial received the ball down the left wing from Ashley Young, dribbled past Skrtel and Clyne with an exquisite touch to fool the former and his very next touch was a brilliant finish past Mignolet in goal. The calmness and composure Martial showed to score that goal was reminiscent of a certain Theirry Henry. 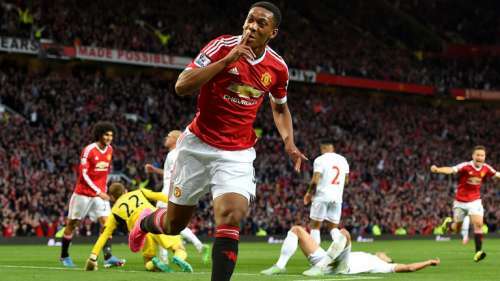 With that goal against Liverpool of all teams, Martial announced his arrival at the theatre of dreams. Manchester United signed Italian forward Federico Macheda from Lazio as a player for the future. However, the youngster’s performance for the reserve side urged Sir Alex Ferguson to name him on the bench for a league game against Aston Villa on 5 April 2009. The significance of this particular game was huge. United had lost their previous two league games and Liverpool were breathing down their neck in the race for the league title. In fact, one of the two defeats United faced was a 4-1 beating at the hands of Liverpool at Old Trafford. United were trailing the game 2-1 at the hour mark and Macheda made his debut for United as a substitute for Nani. United drew level in the 80th minute through Ronaldo and were searching for a winner desperately. With seconds left on the clock, Macheda received the ball inside the box from Ryan Giggs. With his first touch, he took the ball away from the defender and scored with his next touch while he was on the turn. His next appearance for United was in their very next league game and once again Macheda scored the winner. These were his only goals for United that season, but it saved four very important points for the club as United won the league title by four points in the end. Macheda’s goal against Villa gave United the much-needed momentum and lift to go on and clinch the league as they scored 22/24 points since their win against Aston Villa. Wayne Rooney needs no introduction. After all, he is the 16-year-old who ended Arsenal’s 30-match unbeaten run with a scintillating goal to beat David Seaman. Aged 18, Rooney signed for Manchester United and the deal made him the most expensive teenager at that time. Rooney’s debut for United came on 28 September 2004 in a Champions League game against Fenerbahce. The young Englishman marked his debut with a hat-trick and an assist in an eventual 6-2 win over the Turkish giants. His hat-trick made him the second youngest player to score a hat-trick in the Champions League – a record which he still holds. Wayne Rooney has evolved from that 18-year-old to the captain of both Manchester United and England. He is also now the leading goal scorer for England and just six goals short of becoming Manchester United’s all-time leading goal scorer. Kieran Lee is a name that is unfamiliar to many Manchester United fans as he made just three senior appearances for the club before eventually departing in 2008. A central midfielder by trade, he was signed by Manchester United as a youth player and was often deployed as a full back. Lee was named as a substitute in a league cup game against Crewe Alexandra on 25 October 2006. With the score level at 1-1, he came on as a 77th-minute substitute for David Gray in the right back position. The match went to extra time and with just two minutes left for the game to go to penalties, Lee made a lung-bursting run from his own half, latched on to an amazing pass from Alan Smith, ran with the ball towards the opposition goal while a defender was quickly closing him down and unleashed a venomous shot from the edge of the penalty box to clinch the winning goal for Manchester United. Lee was not able to become a first team player at Man Utd, but he is now a regular for Sheffield Wednesday who play in the Championship and he plays in his preferred central midfield role. The 2013/14 season was a very disappointing one for Manchester United as they finished outside the top 4 for the first time in the Premier League era. One of the best moments of United’s disappointing season was in the penultimate game of the season under interim manager Ryan Giggs. James Wilson who was just 18 years old at that time made his first team debut in a Premier League game against Hull City and the youngster marked his Manchester United debut with a brace! His first was a half-volley at the near post following a set piece routine and his second was from a rebound following a shot from Marouane Fellaini. Wilson’s magnificent debut meant that he had scored for Manchester United’s U18 side, U21 side and senior side in the same season. The striker’s career may not have gone in the direction he wanted after such a loud arrival on the big stage. Aged just 20, he still has time to go on and emulate the Manchester United greats or even better them. Prior to Manchester United’s first leg of the Europa League round of 32 clashes against Danish champions Midtjylland in February 2015, the club lost many first team players to injuries. Things got worse in the second leg as Anthony Martial also picked up an injury during warm up leaving Van Gaal with no option but to name 18-year-old Marcus Rashford as a starter. Rashford scored two second-half goals for United at Old Trafford on his debut to turn the tie around. His first goal gave United the lead in the game for the first time and levelled the tie on aggregate and his second put United in the driving seat. His goals also made him United’s youngest goal scorer in European competitions by breaking Geroge Best’s long-standing record. The teenager’s impressive debut and United’s persisting injury problems meant that Van Gaal was forced to start Rashford against Arsenal in a Premier League game days after the Midtjylland fixture. Rashford scored two goals and assisted another as United pulled off a highly unlikely 3-2 win over rivals Arsenal. Anthony Martial, James Wilson and Marcus Rashford are not the only current Manchester United players to score a goal on their debut as Nick Powell who is currently on loan at Hull City achieved the feat back in 2012. Powell made his case for the first-team action when Sir Alex Ferguson was the manager and after impressing in the club’s pre-season tour prior to the 2012-13 season, he made his debut for Man Utd as a substitute in a Premier League game against Wigan Athletic in September. The former Crewe Alexandra player replaced Giggs in the 71st minute and scored his first goal for the club nine minutes later from a Javier Hernandez pass. Since then he has only made eight more appearances for United and failed to score again. He is currently on loan at Hull City in the Championship after struggling to make an impact with Manchester United’s first team. Last but not least – Paul Scholes! One of the most gifted central midfielders of not just his time but in the history of the game and arguably one of the best English players as well. He made his league debut three days later in an away game to Ipswich town and scored a consolation goal in a 3-2 defeat. Paul Scholes certainly lived up to the hype he created after his brace in his debut game and of course in those days players were not overhyped like they are now.